But, for Paste the KiCad Guide says to export/Plot for F.Mask? Which generates a file with a different extension. Though renaming it to .GTP seems to work, but exporting F.Paste exports a .GTP but pads looks smaller. Is there a reason for exporting F.Mask and not F.Paste? Otherwise all works great. Programming the Attiny85 20SU's before putting on the boards are a nightmare but thats for another forum. From my knowledge both F.Mask and F.Paste should work equally well (though @jazozaya might have some more insight on this one). It would appear that our Kicad guide is actually wrong. The correct layer that you need to export for solder paste dispensing is F.Paste, not the F.Mask. We'll look into updating the guide. F.Mask will be the solder mask layer, this is the part of the circuit where you want to peel back the solder mask to expose pads so you can solder to the copper. 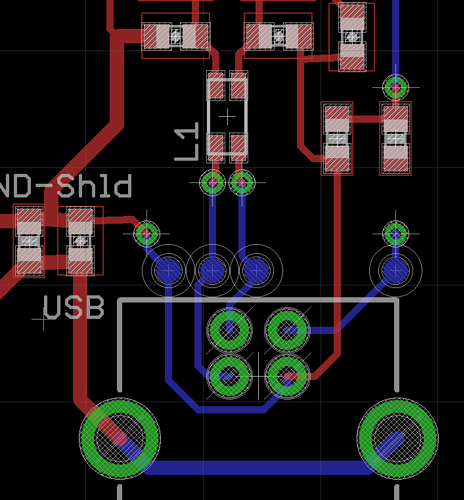 This will include all surface mount pads, but it will also include through hole pads and vias. The F.Paste layer is meant for manufacturing stencils. It will only include surface mount pads and exclude through holes and vias. However, the pads will normally be slightly undersized to reduce the amount of paste being reflowed. Too much solder paste can lead to bridging or tombstoning of components. As an example, here is a snippet of a USB connector and some components and traces in Eagle. 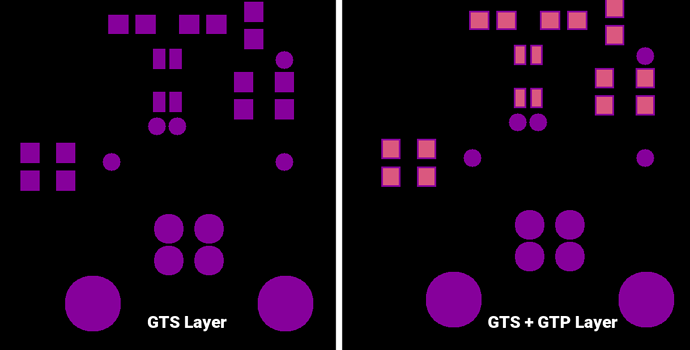 I have exported the GTP and GTS layers below and compared them. Notice that the GTS layer includes the vias and through holes, but the GTP file only includes undersized surface mount pads. Both of these files will be written in the Gerber format, so the V-One software will be able to print both files fine. That's why you are able to change the extension and print with no problems.